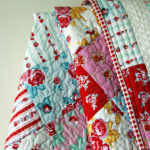 A couple of quick photos of the quilt that I am currently working on. 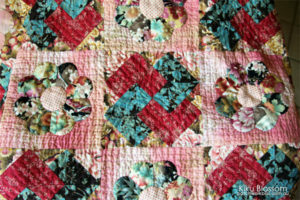 I really need to get it finished so I can publish the pattern, but I’ve been dawdling as I am enjoying the quilting so much. 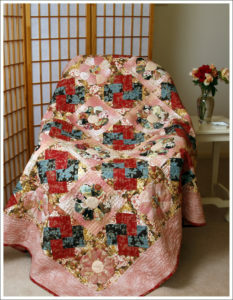 The Kiku Blossom Quilt has has a combination of two blocks. The first is a Dresden Plate. The alternate block is the traditional Card Trick Block. 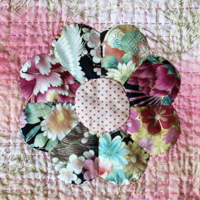 The Kiku Blossom Dresden Plate Block is so plump and divine and is now available as a Free Template so you can enjoy the block as much as I do. 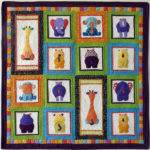 More soon – back to the quilting!